Many families dream of a vacation in Puerto Rico — of course, because of the stunning scenery, from cobblestone streets in Old San Juan to seemingly remote islands like Vieques. The resorts are a major draw, as well, since many are situated on the ocean and offer swimming pools, water sports, restaurants and kids’ programming. If you’re planning a trip to Puerto Rico, consider one of these resorts, chosen with family ratings and our editors’ picks in mind. And if you’re not planning a trip to Puerto Rico, well, you will be soon. 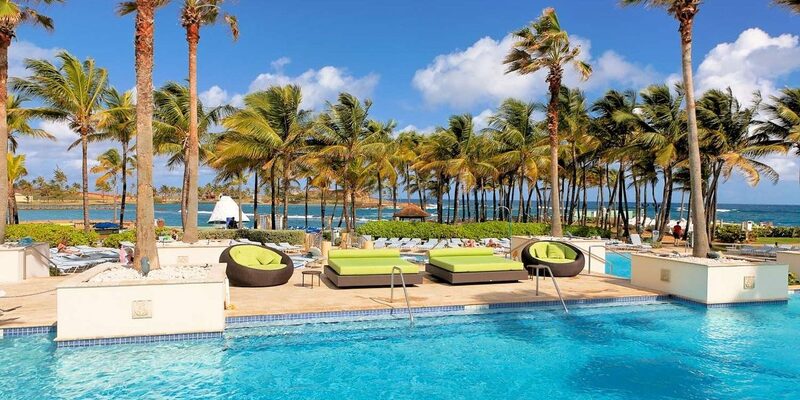 The DoubleTree by Hilton San Juan is an easy choice for families visiting Puerto Rico. It's also a good one, with four restaurants (two of which are quick-service), a swimming pool, laundry facility and free Wi-Fi. The hotel isn't located on the ocean, but provides free shuttle service to nearby Ocean Park Beach, as well as chairs, towels and bottled water. With a location in Downtown San Juan, it puts families close to the capital's best attractions, including Old San Juan and Castillo de San Cristobal. 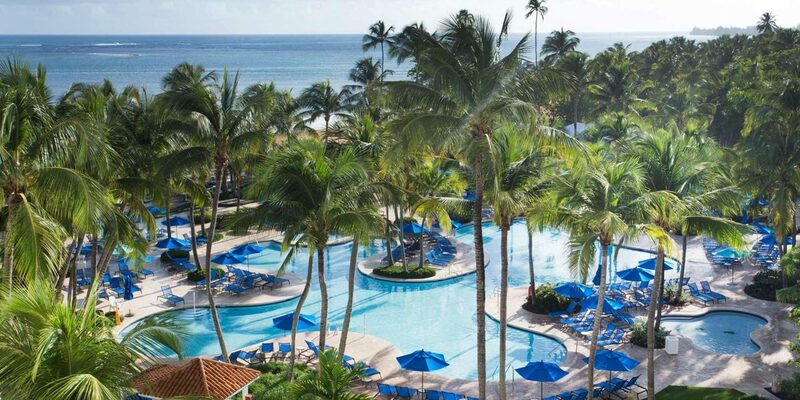 The San Juan Marriott Resort & Stellaris Casino is located in the city, but situated on a beach, providing the best of both worlds in Puerto Rico. The hotel has a swimming pool with a waterslide and hot tub, and of course, a casino. There are six restaurants and bars onsite, along with the option to enjoy a buffet breakfast in the morning -- perfect before you set out to explore El Yunque Rainforest or Old San Juan. When you return, you'll appreciate modern rooms with balconies, mini-fridges, coffeemakers and free Wi-Fi. Las Casitas Village - A Waldorf Astoria Resort is a luxurious resort in Fajardo, at the northern tip of Puerto Rico. Guests of the hotel enjoy one-, two- or three bedroom villas with full kitchens, butler service and grocery service. Guests also enjoy The Las Casitas Village & Golden Door Spa, which even offers treatments for kids. 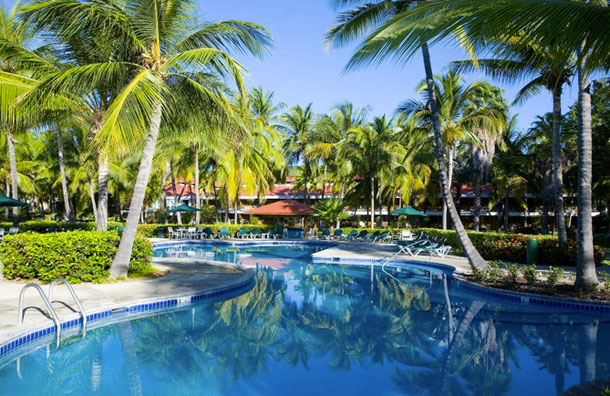 Since the hotel is connected to El Conquistador Resort, guests enjoy access to the adjacent hotel's pools, water park (fee), restaurants and private island. El Conquistador is adjacent to Las Casitas Village, and is arguably the best for families between the two. It features Coqui Water Park, with a nearly vertical waterslide and lazy river, as well as an arcade, kids' club, scavenger hunt and walking tours. Better yet, the hotel also offers access to a private island. Accessible via a short ferry ride, Palomino Island offers water sports, a restaurant, hiking trails and incredible views; look out for the iguanas! The resort has a total of eight restaurants, and accommodations are situated in four buildings. We recommend Las Olas and La Vista. 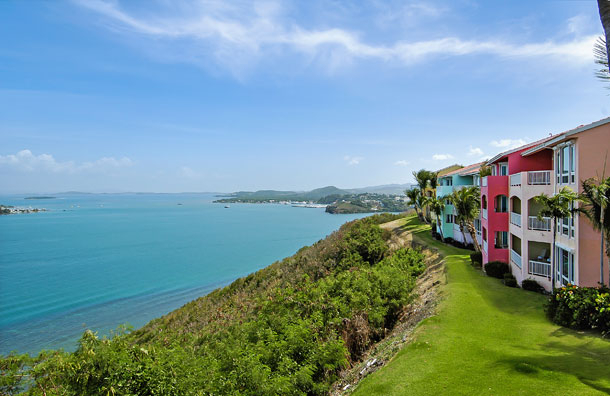 Copamarina Beach Resort is situated oceanfront in Guanica, on the southern coast of Puerto Rico. Accommodations, many of which face the sand and surf, provide mini-refrigerators and free Wi-Fi, plus the option to rent rollaway beds. Luxury Villas up the ante with three bedrooms, two bathrooms and a full-size kitchen -- perfect for multi-generational groups. Services and amenities include swimming pools (two of them just for kids), two restaurants, non-motorized water sports, tennis courts, a playground, and a spa. 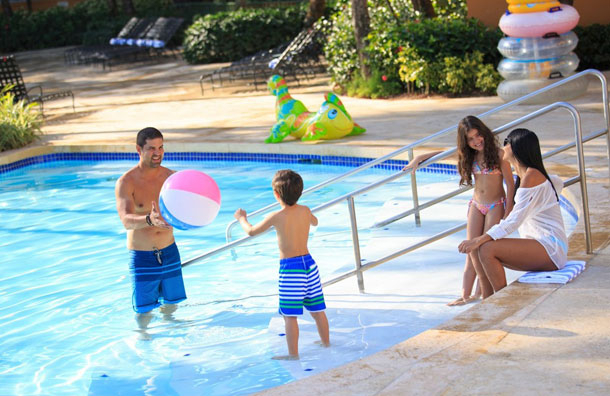 You can"t go wrong with a stay at Courtyard by Marriot Isle Verde, which offers a beautiful pool and stretch of beach, with baby floats, tubes, goggles and other gear available to youngsters, and boogie boards, surf boards and beach balls available to big kids. Teens also enjoy Ping-Pong outdoors, while little ones can splash in the toddler pool or climb on the playground. Parents, on the other hand, can relax with a tropical drink or opt for a massage on the beach. When everyone gets hungry, you'll have your pick at five different restaurants (or in-room dining), including the Banana Ice Cream Parlor & Cafe. All accommodations have mini-fridges, microwaves and coffeemakers, plus private balconies. 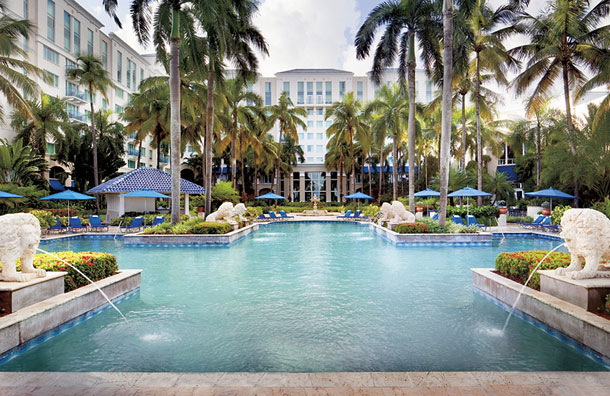 The Ritz-Carlton San Juan delivers the ultimate in luxury, and the ultimate in fun for families -- especially for those with teens. Perks include five restaurants, an oceanfront pool (and a beach, of course), tennis courts and a heavenly spa. Children ages 4 to 12 can participate in Ritz Kids, which offers half- or full-day programs, plus nighttime outings. Kids learn about the natural surroundings of the resort, including coral reefs and other sea life. 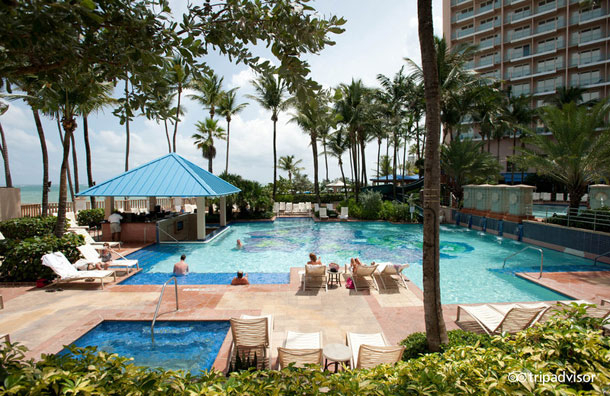 After a busy day, families retire to deluxe rooms or suites, which overlook the ocean, pool, or San Juan. 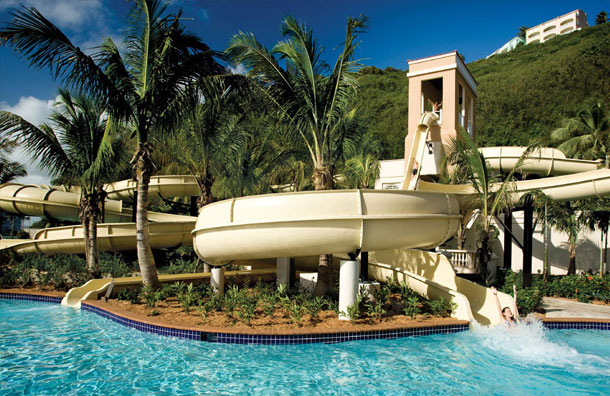 Wyndham Grand Rio Mar Puerto Rico Golf & Beach Resort is the only resort in northeast Puerto Rico, and attracts families with a location near El Yunque Rainforest. Located on the beach, the resort also features an adult pool and an activity pool with a waterslide; dive-in movies; water sports; two golf courses; cultural and natural tours; hiking and biking trails; a playground; and 10 restaurants. Especially fun for kids, there's also the opportunity to witness turtle nesting (May to October). All rooms have private balconies and Wi-Fi; opt for a room with a view of the rainforest. The Pina Colada originated at the historic -- and very well known -- Caribe Hilton San Juan or so they say. (It's an ongoing debate in Puerto Rico). Parents, of course, can order the signature drink while kids splash in the oceanfront pools, play video games in a groovy lounge, or try kayaking and paddle boarding. Other offerings include a secluded beach, kids' club, spa and nine restaurants (kids\" menus available) and bars. Guestrooms and suites have balconies and Wi-Fi. The Condado Plaza Hilton looks and feels like a boutique property, but offers the services and amenities of a traditional beach resort -- a beachfront location (with snorkeling opportunities), multiple pools (including one with a waterslide), and water sports on Condado Lagoon. Kids can also participate in Scout About, a scavenger hunt that encourages them to explore the resort and receive prizes in return, and parents can go on their own scavenger hunt in the onsite casino. Many of the hotel's rooms face the ocean or bay, and onsite dining includes six restaurants, plus a market with grab-and-go items.